Kids have a knack at asking some difficult questions that often leave older people feeling kind of sheepish. From here. The obvious answer is that she is cuter. From the Email Bag via Nurse Jerz. 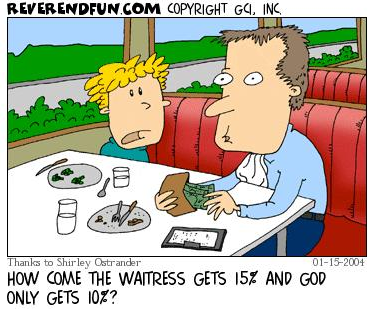 The real reason is that the waitress gets about $2.50/hr, plus the money on the table. Her wages are not and never were put into the bill. If she got $8-10 an hour from management, the bill would be 25-40% higher. Instead, she gets 15%, makes $10-15, and the bill stays where it is. It's a better situation all the way around.